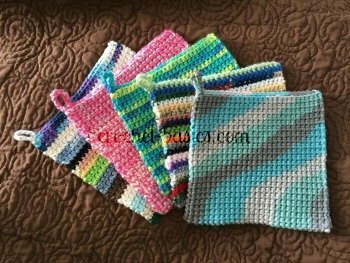 Here's where you learn how to crochet socks! Because we all know that nothing’s better than warm, toasty toes! This is an easy to follow walk-through, with pictures, of my favorite crochet sock pattern. There are probably hundreds of patterns out there to choose from, some may be littler harder than others. The key is to find one pattern that really works well for you. This pattern from Red Heart is my favorite! It really is a great pattern to use. 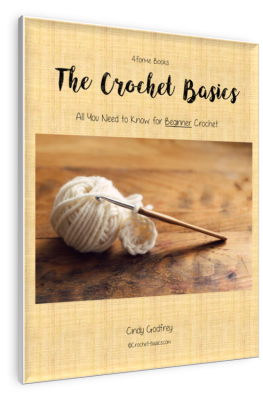 It’s not too difficult and gives you lots of practice on your basic crochet skills. Plus they have a great cuff and they’re just lots of fun! How to Crochet Socks Help . . . Remember, how to crochet socks is a longer walk-through than some of my other tutorials, but that doesn’t mean it’s harder. You also might like to have the pattern from Red Heart in front of you while you use these instructions. 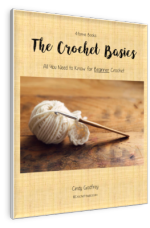 It will give you practice reading a pattern while you're learning how to crochet socks. Check your Gauge and use any size hook to obtain the gauge. Directions are to fit woman’s shoe size 6 – 8; changes for woman’s shoe size 8 ½ – 10 are in parentheses. How to Crochet Socks Hint . . . In order to have matching socks, start each one at the same point in the color sequence of the yarn. Dec (decrease) = draw up a loop in next 2 sc, yarn over and draw through 3 loops on hook. Starting at center back, ch 31. (Right Side): Sc in 2nd ch from hook and in each ch across; turn—30 sc. Ch 1, working in back loops only, sc in each sc across; turn. Repeat Rows 3 and 4. This picture shows, row 5 completed. You can see in the picture that I added a stitch marker to my 5th row. I used this to help me count my rows. Every 5th row I'd add a stitch marker, then I'd make a note of it on my pattern. I would crochet 5 more rows and move my marker, making another note on my pattern that I'd done 5 more rows. That way, I was never counting more than 5 rows at a time. Ch 1, working in back loops only, sc in each sc across; DO NOT TURN. Ch 1, working across row ends of cuff, work 48 (56) sc across. This can be a little tricky. It's all about spacing it as evenly as possible with the correct number of stitches. I find it helps to count before I stitch. Start where you think the stitches should be made and see if it is the correct number, if not, adjust accordingly. Join with a slip st in first sc—48 (56) sc. This joins the two ends of your cuff. Mark beginning/end of rnd; move marker up each rnd. The picture shows round 2 completed. Sc in next 12 (14) sc; TURN leaving remaining sc unworked. Ch 1, sc across next 24 (28) sc for heel flap, removing marker; TURN leaving remaining 24 (28) sc unworked for instep. I hadn't taken my marker out yet in this picture. Ch 1, sc in next 24 (28) sc; turn. Repeat Row 2, ending by working a wrong side row; turn. This picture show Row 9 completed. I use Post-it notes to help me keep my place in my patterns. I stick them right above the line/row I’m working on. They're easy to move around and you can write on them to help count rows/rounds. Ch 1, sc in first 15 (17) sc; TURN, leaving remaining 9 (11) sts unworked. Ch 1, sc in next 6 sc; TURN, leaving remaining 9 (11) sc unworked. Insert the hook into the next sc and pull a loop through. Then insert through the next sc on Row 15 (17). Yo and pull through all three loops. You've completed the decrease over the two rows. turn leaving remaining 7 (9) sc unworked—7 sc. I have broken down the steps to Row 3 to make it easier to understand. On the following rows all the instructions will not be broken down. If you need help remembering how to work the row or it gets a little confusing, just refer back here to row 3. Ch 1, sc in next 6 sc, dec over next sc and next sc on Row 15 (17), sc in next sc on Row 15 (17); turn leaving remaining 7 (9) sc unworked—8 sc. Ch 1, sc in next 7 sc, dec over next sc and next sc on Row 15 (17), sc in next sc; turn leaving remaining 5 (7) sc unworked—9 sc. Ch 1, sc in next 8 sc, dec over next sc and next sc on Row 15 (17), sc in next sc; turn, leaving remaining 5 (7) sc unworked—10 sc. Ch 1, sc in next 9 sc, dec over next sc and next sc on Row 15 (17), sc in next sc; turn, leaving remaining 3 (5) sc unworked—11 sc. Ch 1, sc in next 10 sc, dec over next sc and next sc on Row 15 (17), sc in next sc; turn, leaving remaining 3 (5) sc unworked—12 sc. Ch 1, sc in next 11 sc, dec over next sc and next sc on Row 15 (17), sc in next sc; turn, leaving remaining 1 (3) sc unworked—13 sc. Ch 1, sc in next 12 sc, dec over next sc and next sc on Row 15 (17), sc in next sc; turn, leaving remaining 1 (3) sc unworked—14 sc. In this how to crochet socks walk-through, I didn't work the larger size in my walk-through and pictures, but if you did, these next 2 steps are specifically for you. Ch 1, sc in next 13 sc, dec over next sc and next sc on Row 17, sc in next sc; turn, leaving remaining sc unworked—15 sc. Don't forget to count your stitches in each row or round. It will help you find any mistakes much quicker. Row 12: Ch 1, sc in next 14 sc, dec over next sc and next sc on Row 17, sc in next sc; turn, leaving remaining sc unworked—16 sc. Ch 1, sc in next 13 (15) sc, dec over next sc and next sc on Row 15 (17); turn—14 (16) sc. Ch 1, sc in next 13 (15) sc, dec over next sc and next sc on Row 15 (17)—14 (16) sc. With right side of heel facing you, join with an sc in 8 (9)th sc of Row 12 (14). Joining with a sc is really easy. Here's how you do it. Begin with a slip knot of your hook. Count over to the 8 (9)th stitch of row 12 (14) and insert the hook into that stitch. Yo and pull through the loop. Now you have 2 loops on your hook. Yo again and pull through both loops. That's all there is to joining with a sc. join with a slip st in first sc and mark this sc for beginning of rnd—62 (72) sts. sc in each sc to end of rnd—60 (70) sc. Repeat Rnd 2—48 (58) sc. The picture shows round 8 completed. Remove gusset markers when working next rnd. Repeat Rnd 9 until 2 1/2” less than desired length from beginning of heel. I repeated round 9 - 25 times. The picture shows those rounds completed. sc to 12th (14th) sc from right marker on bottom of foot and mark for beginning of rnd with double markers. sc to end of rnd—44 (54) sc. Repeat Rows 1 and 2—36 (46) sc. Picture shows row 4 completed. repeat from * once; sc to end of rnd—32 (42) sc. Repeat Rnd 7 —12 (14) sc. Turn sock to wrong side and sew toe seam. Sew back cuff seam and weave in all ends. You did it, one sock done!! Now you know how to crochet socks! It feels great, doesn't it! Now repeat the how to crochet socks instructions for your second sock and then enjoy warm, toasty toes! !